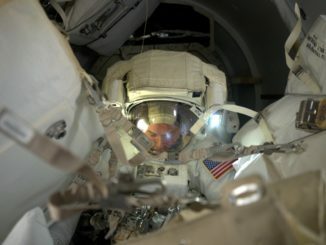 NASA space station managers decided Thursday to delay the first two of three planned spacewalks by one day to give flight controllers and engineers a chance to catch their collective breath after exhaustive troubleshooting to verify the health of critical internal spacesuit components. 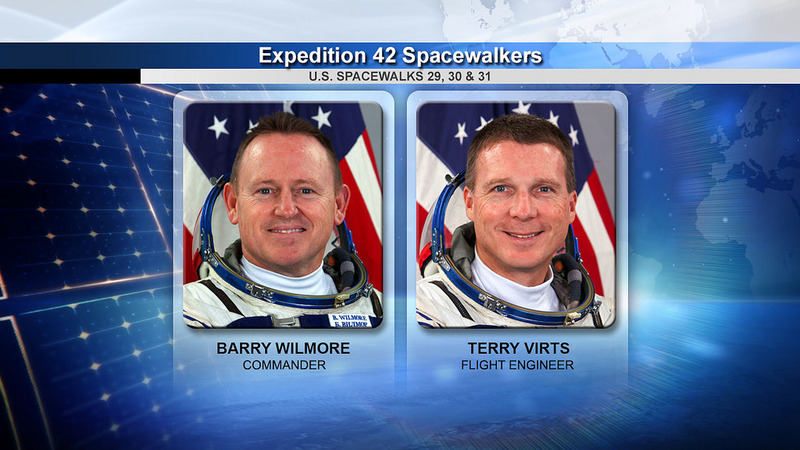 Expedition 42 commander Barry “Butch” Wilmore and Terry Virts plan to install more than 760 feet of power and data cables needed for new docking mechanisms that will be used by commercial crew ferry ships being built by Boeing and SpaceX. They also plan to install and hook up two sets of antennas, part of a new communications system that will be used by crews approaching and departing the lab complex. The first spacewalk, originally planned for Friday, will slip to Saturday, starting around 7:10 a.m. EST (GMT-5) and the second outing will move one day to Wednesday. The third EVA remains on track for March 1 as originally planned pending additional review. The decision to press ahead, albeit with a slight delay, was made after engineers concluded the suits that will be worn by Wilmore and Virts were healthy and not likely to suffer failures due to corrosion like that found in two spacesuit fan/pump/separator assemblies that were returned to Earth for analysis. The modules in question circulate oxygen and cooling water throughout the spacesuit using a common motor and drive shaft. Each suit also is equipped with an emergency backup system. After extensive troubleshooting, engineers concluded the drive shaft bearing corrosion seen in the fan assemblies shipped back to Earth likely was the result of additional testing implemented after water backed up into the helmet of spacewalker Luca Parmitano in 2013. While some bearing corrosion is believed to be present in the fan/pump/separator in Virts’ spacesuit, analysis indicates it is well below the threshold that could cause the unit to fail during use. And even if it did, officials said, the astronaut would have more than enough time to get back to the station’s airlock using the suit’s backup system. As a result, mission managers cleared the astronauts to proceed after a one-day delay. 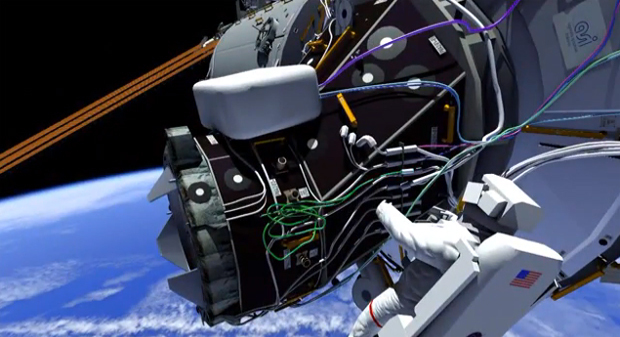 During Saturday’s EVA, Wilmore and Virts plan to begin installation of six long cables with multiple connectors near the front of the station to support the new Boeing-built docking adapters. The cable connections will be continued during their second spacewalk next week, along with work to lubricate grapple fittings on the lab’s robot arm. During their third excursion, the astronauts will install the new Common Communications for Visiting Vehicles, or C2V2, antennas and cabling on both sides of the station’s main power truss. Over the next year or so, at least four additional spacewalks will be needed to complete the most extensive space station reconfiguration since the shuttle fleet was retired in 2011, work requiring nearly 900 hours of crew time. Along with the near-term work to install cabling and communications gear, future station crews will robotically attach the new docking adapters, tentatively scheduled for launch aboard SpaceX Dragon cargo ships in June and December respectively . In addition, the station’s robot arm will be used to move a storage compartment known as the Permanent Multipurpose Module, or PMM, from the Earth-facing port of the central Unity module to the forward port of the nearby Tranquility compartment. That will free up Unity’s port for use by unpiloted cargo ships. The PMM move is targeted for the June timeframe. A docking port extension known as Pressurized Mating Adapter No. 3 then will be moved from Tranquility’s outboard port to the upper port of the Harmony module where the second of the new docking adapters will be mounted. That move is planned for October. During that same timeframe, another SpaceX cargo ship is expected to deliver an inflatable module built by Bigelow Aerospace that will be attached to Tranquility’s aft-facing port. 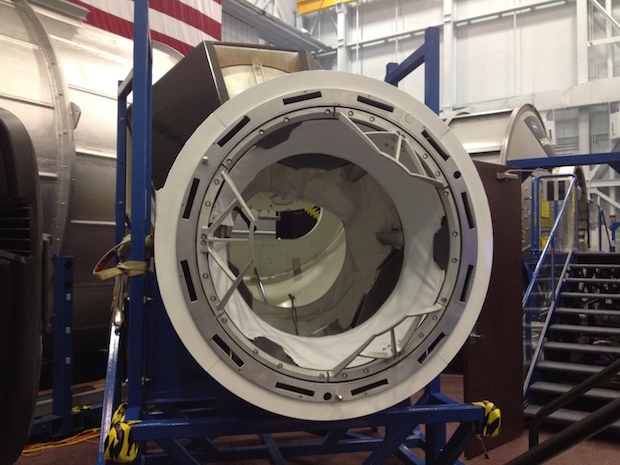 The Bigelow Expandable Activity Module, or BEAM, will remain in place for two years as a technology demonstration project. All in all, some 880 hours of crew time will be needed to prepare for and carry out the seven planned spacewalks, to install internal wiring and for the robot arm operations to install the docking adapters and relocate the PMM and PMA-3. When the work is completed, two ports will be available for dockings by either Boeing or SpaceX crew capsules starting in 2017: one on the front of the Harmony module, the same port once used by visiting space shuttles, and the second on the top side of Harmony. Unpiloted cargo ships will be able to berth at a port on the Earth-facing side of Harmony — the same port currently used by cargo craft — as well as the port on the Earth-facing side of the Unity module where the PMM was originally attached. Flights by Boeing’s CST-100 spacecraft and SpaceX’s crewed Dragon capsule are not expected before late 2017. 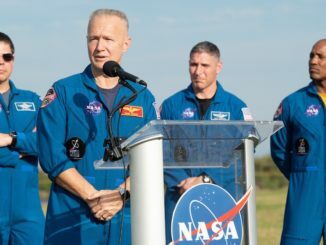 But space station Program Manager Mike Suffredini said he wants to get NASA’s part of the work done as soon as possible as a hedge against possible problems down the road. “Getting it all done by the end of 2015 means if I run into anything where, God forbid, I have to make a mod to the docking system or maybe change them out or anything like that, I have time to work through that,” he said in a recent interview. The decision to press ahead with the first three spacewalks was made after mission managers reviewed troubleshooting to figure out what caused problems with two fan/pump/separators during testing in orbit. The fan/pump/separator is used to circulate oxygen and cooling water through the spacesuit and it must be operating normally before astronauts can be cleared to exit the station’s airlock. A failure during a spacewalk would not be life threatening, but it would force the crew member to quickly return to the station’s airlock. During routine maintenance aboard the space station last December, the fan/pump/separator in one spacesuit failed to spin up. A second unit being tested in January also failed to start. Both were returned to Earth last week aboard a SpaceX Dragon cargo ship for detailed analysis. When the pump modules were inspected, engineers found corrosion in one of two sets of driveshaft bearings, presumably caused by repeated exposure to water during tests to make sure no contaminants could clog a critical filter. That’s what engineers believe allowed water to back up into Parmitano’s space helmet during a 2013 EVA. The additional water chemistry testing apparently subjected the fan/pump/separator bearings to extended periods of moisture, creating the corrosion that eventually prevented the shaft from spinning up normally. Wilmore’s suit, serial number 3003, is the newest spacesuit on the station and its fan/pump/separator is original equipment with no signs of any problems. Virts’ suit, 3013, also checked out, but slight changes in current to its fan/pump/separator indicate a small amount of corrosion may be present. Kenny Todd, space station operations and integration manager at the Johnson Space Center in Houston, said engineers do not believe the fan in Virts’ suit will fail once it has spun up to normal operating speeds. And even if it did, the astronaut would not be in any danger. Todd emphasized the current problem had nothing to do with the contamination issue that caused water to back up into Parmitano’s helmet with potentially catastrophic results. “With the water in the helmet, that was a totally different root cause issue,” Todd said. “That was an issue with port holes getting clogged up in the water separator that was due to the water chemistry issue we talked about earlier. Through that clogging, water was allowed to get into the vent flow that goes up into the helmet. To prevent the corrosion problem from occurring in the future, Todd said engineers are developing alternative procedures to improve water removal and suit drying after water chemistry testing.